A day spent in the countryside can involve so many different activities. You might choose to enjoy a good walk, take your motorbike or car out for a run, enjoy a meal at a country pub, hop on board a boat or even enjoy the magic of steam. This lovely scene depicts just some of the leisure activities waiting to be discovered in the wonderful landscapes of the Yorkshire Dales. High quality 1000 piece cardboard jigsaw puzzle. The finished puzzle measures 70 x 50cm when complete. Suitable for ages 12 years and up. Made from strong premium grade cardboard, with linen finish print to minimise glare on puzzle image. At Ravensburger we have over 50 years’ worth of experience in the manufacture of puzzles. Not only do we make the best selection of puzzles, we also pride ourselves on having the highest quality. Individual pieces are stamped with such precision that a quiet ""click"" can be heard when one piece is inserted in the other - this phenomenon is so unique that we have given it its own name ‘Softclick Technology.’ Our puzzles are made using unique punching templates and punching tools, which are hand-crafted with watchmaker precision to ensure the greatest possible accuracy and variety of the puzzle pieces. 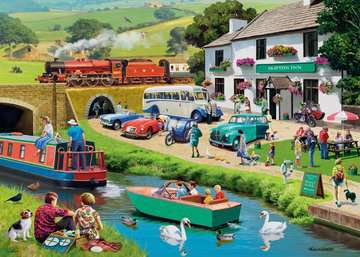 Yorkshire born and based Kevin Walsh's nostalgic images appear across the world on all sorts of products including greetings cards, needlework kits, kitchenware, collectable plants and prints and, of course, jigsaw puzzles. Kevin's meticulous research, masterful brushwork and bold colours make his work popular with puzzlers across the world.